Each year, the Double H Ranch receives generous donations from events that are organized by individuals, schools, businesses and organizations within the community. The money and awareness raised through these events help to support our year-round programs that are provided free of charge to our campers and their families. Are you interested in hosting an event to support Camp? Our staff will work with you to find the right level of event support, and make sure you have the resources you need to represent the Double H Ranch. If you would like to organize a Fundraising by Friends event, please follow the guidelines provided before beginning any fundraiser or event on our behalf. All requests must be in writing. An Event Proposal Form must be completed and submitted to the Development Office. Once received, the form will be reviewed by our Special Event Committee, chaired by Board Members. The Double H Ranch does not guarantee event approval. Once a decision is reached you will be notified by Ranch staff with further information. The Double H Ranch doesn’t guarantee access to our mailing list, auction/raffle prizes or staff attendance, but will be as supportive as possible to make the event a success. The use of our camp name and logo is not allowed prior to the approval of your event. 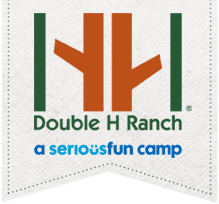 The Double H Ranch must approve all printed materials and promotional information prior to use, including use of our logo and any related verbiage. A customized, online fundraising page can be provided to you upon request and approval of your event. Once the event has taken place donations must be submitted to the Double H Ranch within 60 days. Garage Sale, book sale, bake sale, plant sale, etc. To get started with your event, please contact TJ Roode, Development Coordinator, 518-696-5676, ext. 269 or e-mail tjroode@doublehranch.org.